There are usually many of places I have to go in any given day. I usually go to work. Sometimes I have to put gas in the truck. There’s always somewhere I need to visit to stock-up on something. It seems, for every place I go… there’s a reason. I’m rarely just out wandering around. I get the impression that Jesus was like this too. When He started walking, He usually had a reason… and a purpose. There’s an interesting statement at the beginning of the fourth chapter of John that has always caught my eye. It says that Jesus “had to pass through Samaria”. I’ve read several theories as to why people think He “had to” travel that road. History tells us that most Jews chose to travel a different route from Jerusalem to Galilee. The Jews and Samaritans had several long-standing theological disagreements that had caused separation… but for some reason Jesus chose to engage instead of ignore. Jesus met a woman in Samaria. Most readers surmise that the Samaritan woman was terribly lost that day. While she well knew her way to the town’s source of water, it seems clear she had not been able to find all she was looking for in life. In the end we know this woman, and many in her village, believe Jesus is the Promised Messiah. My question is… what was this woman’s spiritual condition prior to Jesus’ arrival? Was she really an unbelieving soul that Jesus converted that day… or could she have been a “true believer” from the wrong side of the tracks? I suspect she was not as spiritually lost as many conclude. The fact that she wasn’t a Jew… shouldn’t automatically exclude her from being a believer in God’s promises. Let’s look at the contextual clues within the story to see what options they might allow. Jesus started the conversation by asking for some water… and some back-and-forth banter ensues between the two. 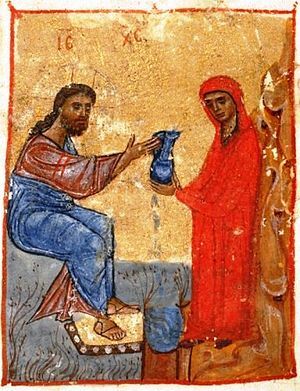 Eventually, the woman asked if Jesus is greater than her ancestor, Jacob, who created the well. It is clear that this woman had a close connection with Israel, the person… while, at the same time, separated from Israel, the people. Jesus then tells her things about her life that no stranger would know. Her immediate conclusion when shown the all-knowing power of God… was to believe Jesus to be from God. But she was still unsure as to exactly who He was. Then the conversation changed. Thus far it had been between two people… Jesus talking to a woman. In John 4:20, our two characters become representatives of their larger social circles. The woman now represents the Samaritan people as a whole… and Jesus represents the Jews. Jesus’ response in John 4:21-24 uses all plural pronouns. We don’t get to see this in the English translations… but Jesus isn’t as much speaking to the woman, as through the woman to the Samaritan people. He describes how the Samaritan believers should worship (Philippians 3:3). then Jesus declares Himself to be that very Messiah. With this knowledge… the woman ran back to town, gathered together some friends, and they come to understand Jesus as Messiah too. After Jesus spends more time there… many more believe. I believe there was a contingency within Samaria who were true believers in God. I’ll admit the Samaritans had some problems in their theology, but should that automatically disqualify them from the possibility of possessing true faith? Did your misunderstandings keep you from believing? It’s clear the Samaritans were confused about where to worship… but Jesus didn’t seem too concerned about that. More importantly, this woman (and those she went back and spoke to) were looking forward to the Promised One of God who would “declare all things” to them. That suggests to me that at least some, in Samaria, had a grasp on the essentials of what faith required. As Jesus’ public ministry progressed, it would have been essential that He revealed himself to the Old Testament saints who were looking for him. They must first accept Him as Messiah… so that they could eventually understand what Messiah was really there to accomplish. Later, in Acts 8:4, we get to see the Samaritans receive the “rest of the story” about Christ. Mark… we are all misfits… to some degree 😉 Thanks for the comment.